Sophisticated details. Modern amenities and features. The BLOCK is your exclusive affordable condominium. 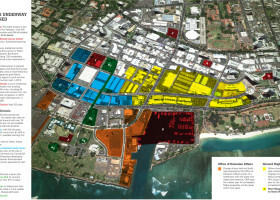 Designed to fit in with the artistic interest throughout Kaka’ako without the attitude of the more costly condos being produced. The BLOCK – luxurious sentiments without the price tag. 7 Stories with 153 Units, The BLOCK is modern, mid-rise, urban living with studios and 1 & 2 bed units in single story “flat” and 2-story “loft” street front layouts. There are 92 Parking spaces for designated units utilizing a mechanical parking system*, scooter and motorcycle parking and double-decker secure bike parking. Entertain friends atop a rooftop furnished deck or in your own space accessorized with barn doors**, cararra marble and polished concrete floors***. Modern amenities will give you those convenient touches that are meant to make your busy day easier.